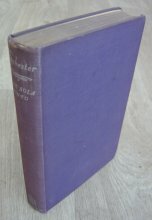 The Iliad of Homer - Tanslated by Maurice Hewlett and published in 1928 by The Cresset Press Ltd. 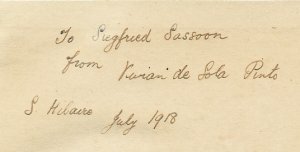 This book comes from the library of Vivian de Sola Pinto (bookplate on the right), who was Siegfried Sassoon’s second in command while they served with the Royal Welsh Fusiliers in France during the First World War. He was know as ‘Velmore’ in the Sherston Memoirs. Rochester: Portrait of a Restoration Poet - by Vivian De Sola Pinto, published in 1935 by John Lane The Bodley Head. Vivian De Sola Pinto was Siegfried Sassoon’s second in command in the Royal Welsh Fusiliers during the First World War, and was the character ‘Velmore’ in the Sherston Trilogy. Sassoon must have introduced De Sola Pinto to Lady Ottoline Morrell during one of his many visits and it must have been there that De Sola Pinto met Desmond MacCarthy, literary critic and journalist, who was a friend of the Morrells. The book is inscribed on the front endpaper “To Mr Desmond MacCarthy from V. de S. Pinto 19-xi-’38.” How this book found its way into Ottoline’s library is not known, but on the next page can be found the name of its final owner, “Julian Goodman.” Julian was Ottoline’s daughter; whose first husband was Sir Victor Goodman.